2) Eat healthier. I also did this, cutting down on the takeaways, and not snacking as much. Not that it showed on the scales mind, as I am towards the upper part of what is considered a 'healthy BMI' All this despite doing a pretty physical job. 3) Drink less. Well, 2 out of 3 isn't bad. Though I am still sticking to the recommended government weekly limits, give or take. I will be most certainly look forward to getting back into trying new ciders and visiting nice pubs, one trip to Wetherspoons for a pint is the sum total of my pub visits during the summer. Or at least the last sentence was true until I decided to celebrate the start of the football season by going out with some mates from work on Friday night. A good few pints were consumed, all stuff I have had many times before sadly. But I knew I would be driving the next day, so I applied some restraint, and even finished the evening in time to get one of the last buses home at 22:15. After waking at around 8AM, I got ready and met Anwar in Wycombe just after 9am as we had arranged. We had a fairly uneventful journey, save for someone losing a load of junk off the back of their trailer and holding the traffic up for just over 5 minutes while they collected it out of the road. There was also an annoying average speed check at 50MPH for a substantial part of the M25, but at least we were moving. Our first stop off was Kent League team Woodstock Sports, who play just outside Sittingbourne. And it will be the home of Sittingbourne FC as well from this season after they vacated their old ground at the end of last season. It was pretty basic with a couple of small stands. Though perfectly adequate for their needs, I am surprised it got past the ground graders for step 4 level, with not a lot of cover, even if it was very well kept. Then we went on to visit Sittingbourne's old grounds. Firstly the Greyhound stadium that they initially played at, which had a huge modern stand and some terracing. They played at this ground from 1990-2002 but financial problems forced them to leave. They built a smaller ground, Bourne Park, right next to the greyhound stadium. This new stadium was more suited to their needs, with 3000 capacity and a decent amount of covered terracing. There was also an impressive 300 seater main stand, which looked like it was made of metal and could be moved. However unlike the many metal stands around at the moment, this was raised well above ground level and offered a good view of the pitch. Again, financial reasons caused them to leave for Woodstock Sports, but they could do a lot worse than take the stand with them if that is possible. In any case, it was good to go and get some pictures of the ground before it went for good. We arrived in Faversham just after 12 and parked up at the ground. On reflection, it was too late. I should have allowed more time in a town that looked really nice and had a few decent looking bookshops that I am sure I could have found a few football related gems in. 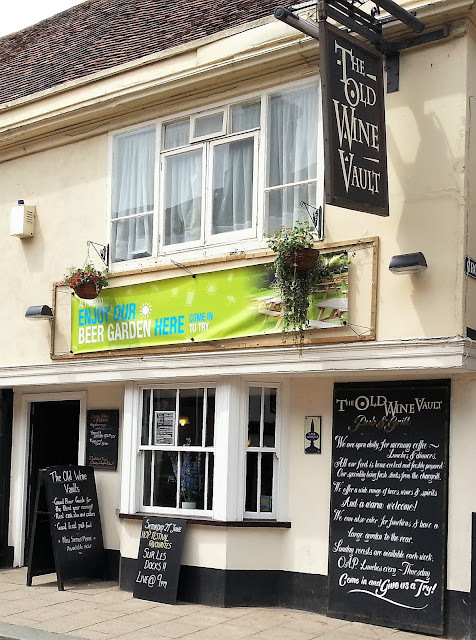 There was also a smashing pub called The Old Wine Vault, where they had a few ciders on that I had not had before. They also had a nice looking menu which I would have liked to try, and it's yet another place I fancy revisiting. In the end, I only had time for 1 pint. 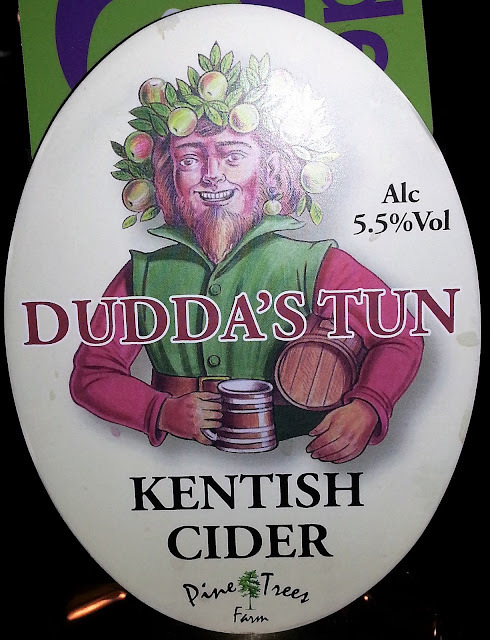 But at least it was a very nice one, called Dudda's Tun from a small brewery called Pine Trees Farm, based in Kent. There was just time to grab a quick Saveloy and Chips from a nearby chippy before walking back to the ground. We arrived back at the ground with around 10 minutes to spare, which was just as well as there were queues to get in. Luckily we just made it in time for kick off. Sadly there were no programmes or team sheets though, a lost opportunity for the club, given that so many people wanted one. They gave me an old programme for free, as they had not issued for today's game. I bumped into Kirby Knitter off of the non-league forum and also fellow hopper Laurence, who I had first met on the NCEL groundhop back in March, as well as a load of new people I was introduced to. The game was a good one, which was decent given that pre-season friendlies are generally slow paced, given the hot weather. Faversham looked a useful side and were well on top for the opening 15 minutes. They got their reward on 11 minutes, taking the lead through a great free kick from Wayne Wilson. The goal would have graced any game as it flew past Gillingham keeper Stuart Nelson. The league side were soon back on level terms, however, on the quarter hour mark. Aaron Millbank was on hand to turn in the rebound after Faversham keeper Simon Overland tipped the initial shot onto the post. On 23 minutes Gillingham took the lead as Bradley Dack chipped in a second goal, and they deserved that as they took control of the game. It was still 2-1 at the half time interval and so I went in their clubhouse for a look around. There was a pretty standard selection of drinks, but best of all, plenty of memorabilia on the walls to look at, certainly one of the better clubhouses for this. Gillingham completely changed their side at half time and Faversham made a fair few changes too. It was the league side who had much the better of the proceedings, though Faversham did have their chances. The Gills further extended their lead when former Wycombe loanee Adam Birchall scored with a header from a great right-wing cross on 66 minutes. Faversham reduced the arrears on 74, again it was a cross that caused all the trouble. Perhaps the young Gillingham keeper should have done better, but in any case Lyndon Rowland was on hand to tap in. A couple of minutes later the visitors restored their 2 goal lead when Birchall scored again, this time a great long-range shot that flew past the Faversham keeper. 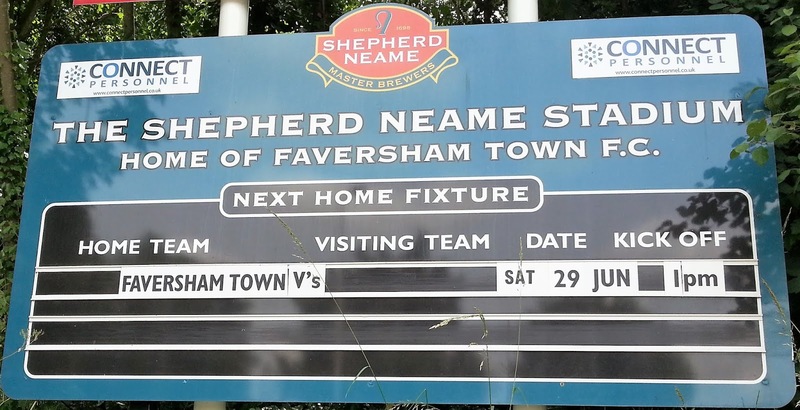 THE SHEPHERD NEAME STADIUM is a traditional non-league venue. 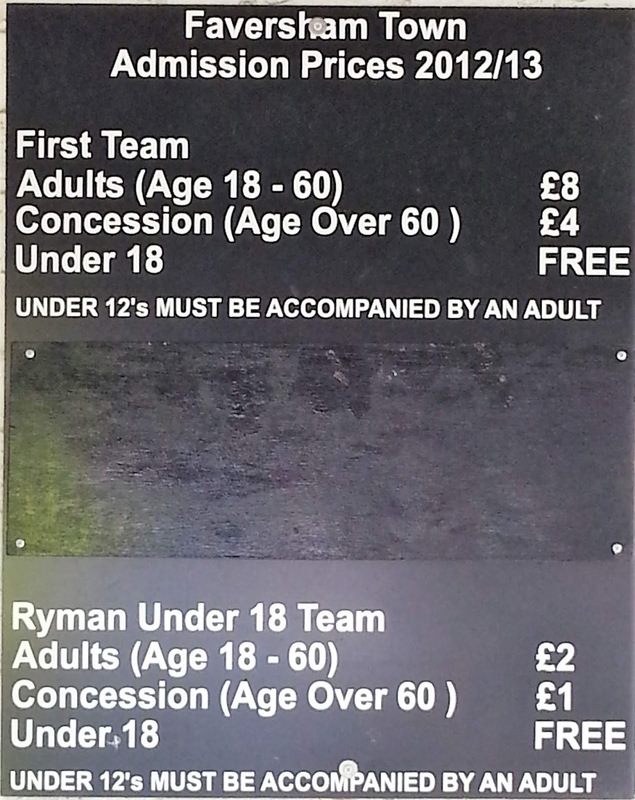 To your left, as you go through the turnstile there is the main stand. This holds around 200 under cover, as well as having some standing room too. There is further cover at the clubhouse end, probably around 500. The rest of the ground is open terracing. I didn't use the tea bar, but the clubhouse is one of the better I have been in. There was no club shop that I could see, but they did have a table selling a basic range of souvenirs. 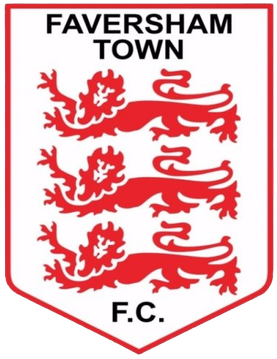 I'd recommend a visit to this friendly club and traditional ground, just make sure you allow yourself a bit of time to explore the town, which is just over a 10-minute walk away.